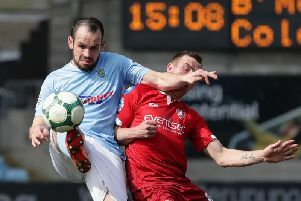 Ballymena United have added Albert Watson to their squad after announcing his signing on Thursday night. The Belfast born centre half previously spent ten seasons wearing the Sky Blue, amassing 316 appearances and scoring ten goals. Making his debut at just 16, he became Ballymena United’s youngest ever club captain. Following a spell at Linfield where he secured back to back league and Cup doubles, the 33 year old centre half went on to captain full time North America Soccer League side FC Edmonton in Canada. After a season playing in Iceland for KR Reykjavik, he has returned to the Irish League. “Bryan McLoughlin and I are delighted to have signed Albert, bringing him home so to speak. “In the first instance this is a short term contract to the end of the season when both Albert and ourselves will be able to review things. “This is a set of circumstances where we all felt that it could be mutually beneficial, we have some big games coming up and in this part of the season we want to be as well equipped as possible. “When Albert became available and expresses his desire to join us, it just made common sense. This it to the end of the season but who knows where it takes us from there. Watso said: “To work with David again from my time at Linfield is a big attraction but it’s about coming home to Ballymena United. “ I was here ten seasons and I still love the place and the great proper football people behind the club.